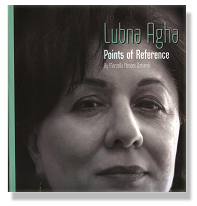 Lubna Agha emerged on the art scene during the early 1970s. Young, prolific, and talented, she took PakistanÃ¢ÂÂs art world by storm. Within only few years, she won numerous laurels, held voluminous one-person exhibitions, and participated in shows with a career spanning over the three decades, his preeminent artistÃ¢ÂÂs work has seen monumental shifts in style-marked by courageous experimentation and innovation- constantly propelling her work in new and challenging areas. In this compellingly written collection of monographs, a foremost scholar and critic of modern South Asian art, dr. Marcella Sirhandi, captures the journey of AghaÃ¢ÂÂs creative mind. As poignantly described by Salima Hashmi, Ã¢ÂÂLubna AghaÃ¢ÂÂs reclamations take her into a kaleidoscope of vivid color, an inescapable zone of wonderÃ¢ÂÂ- the reader is invited share in the in-depth look into this artistÃ¢ÂÂs stirring and immutable world. Fomma would like to acknowledge the editorial assistance and insightful suggestions virginia clean air act electronic cigarette of Michele Frick, professor of art history at Kansas City of Art Institute. Marcella Sirhandi received her PhD in Asian art history from Ohio State University. Research for her dissertation on Pakistan Artist Abdul Rahman Chughtai was funded by the American Institute of Pakistan Studies and Fulbright supported the research for her book Contemporary Painting in Pakistan. She curated exhibitions and wrote catalogs on contemporary Indians and Pakistani artists including Jamini Roy, Goan painter A.X. Trindade, miniature painter Bashir Ahmed as well as South Asian art group exhibitions. Sirhandi has published articles in Arts of Asia, Eastern Art Report. Libas International, Arts and the Islamic World and The Art Journal. She taught the inaugural course at National College of arts program and currently teaches Asian art history at Oklahoma State University. She is writing a book on the New Miniature painting in Pakistan. Price: Rs. 750 plus p.&p.